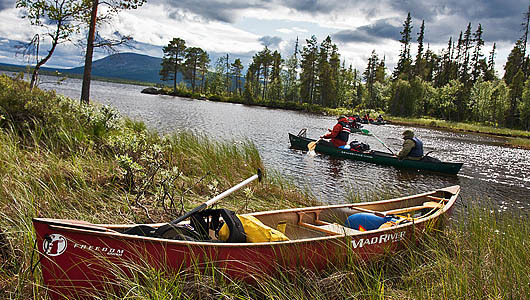 To travel with canoe or a kayak is maybe the most natural way to experience the summer in Lapland. You paddle away from the mosquitoes, no heavy backpack on your back, many nice and varying tours and no crowds of people as it can be on some hiking routes along the popular hiking trails. Around Jokkmokk you find paddle waters that suits almost everybody. Week long tours or easier and more easy accessible waters for those who only want to paddle for a few hours. From us you can rent both kayaks and canoes of different models. We also have tents, canoe carts and other outdoor equipment for rent. We also offer guided tours and if you have your own ideas about a paddling- or hiking tour don’t hesitate to contact us. Paddle tour at Stor-Skabram lake (Easy and easily accessible) The Skabram lake is situated only 3 km west from central Jokkmokk. Suitable for a day tour or for those who only like canoeing for a few hours. Jokkmokkguiderna canoe central is located by the shore of the Skabram lake. The upper part of Lilla-Lule river (5-7 days) Canoeing and kayaking along the river valley. From the wood lands in the east towards the mountains in the west. This is a weeklong tour for you who like to experience the wilderness of Swedish Lapland. The Pearl river nature reserve with canoe or kayak (3-14 days) Without a doubt, this is a true wilderness area. Lake Karats is long and narrow and stretches approx 25 km from east to west. In the east there is flat areas with small islands and islets. In the west the valley gets more narrow and the lake is lined by small mountains.